My main objection to white flowers is that they tend to look awful once they’re past their prime. They open in perfection but can quickly brown, detracting from those that are just starting. 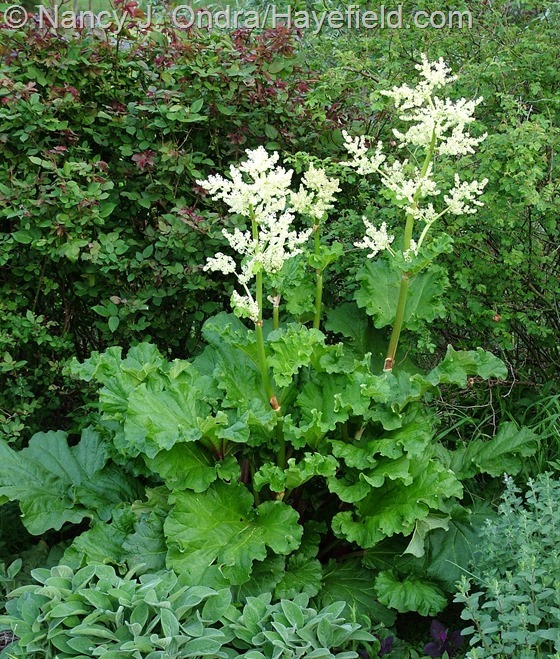 And rhubarb (Rheum rhabarbarum)—what a waste to cut off the flowers! 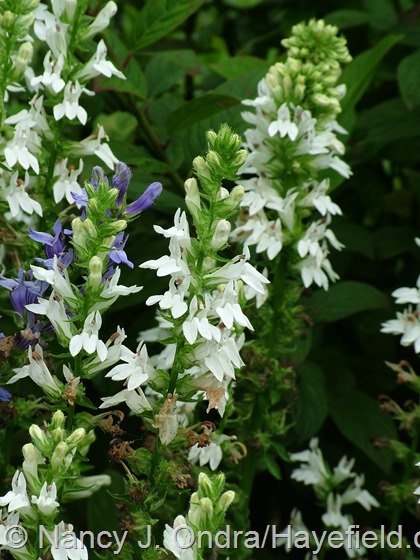 Sometimes, I want to try a white-flowered plant because I’ve heard good things about it, or because it’s fun or unusual. 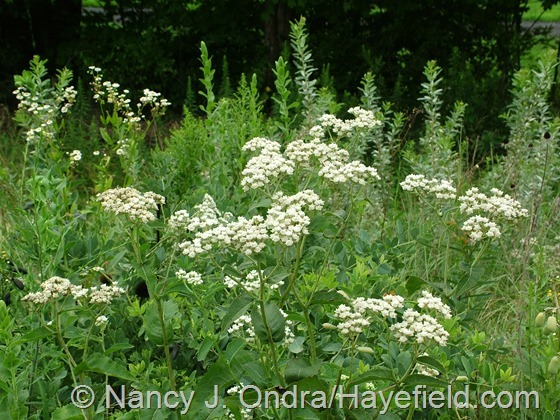 I was ok with adding wild quinine (Parthenium integrifolium) to my meadow, for instance, because it was supposed to be so tough and long-flowering. Once I saw it was all that and then some, I brought some into the garden. I had to give bats-in-the-belfry (Campanula trachelium) a try just for the name, so I figured I’d sow the white form instead of the usual purple-blue. It didn’t stick around long, but it made me smile while it lasted. 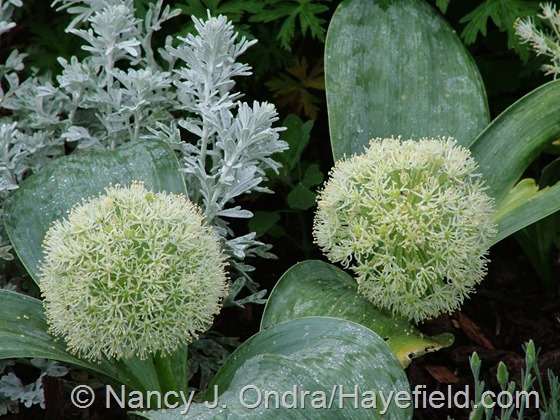 It’s hard to resist any of the ball-flowered alliums, so for a while, I had both ‘Ivory Queen’ Turkestan onion (Allium karataviense, above) and hybrid ‘Mount Everest’ (below). Annual bunny tail or hare’s tail grass (Lagurus ovatus) is way up there on the adorability scale. 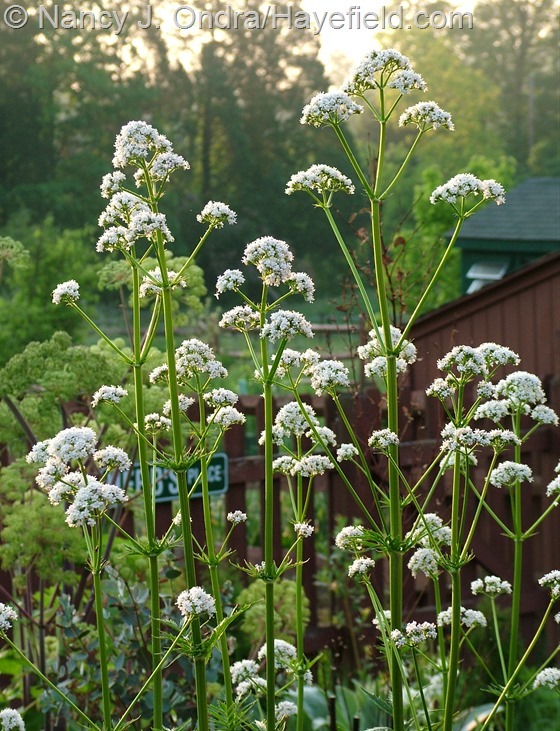 There’s nothing so demure about garden heliotrope (Valeriana officinalis) when its 6-foot-tall stems are topped with white flowers in summer, but I admire its vigor and enjoy its wonderful fragrance. 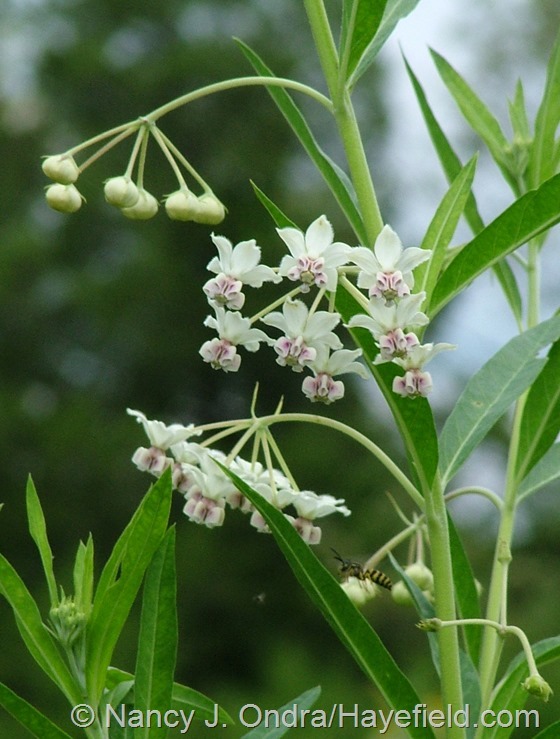 And there’s the equally tall swan plant (Gomphocarpus physocarpus), a milkweed relative that’s usually grown for its puffed-up seedpods, but I think the individual flowers are pretty cool too. Still, I’ve never much liked white flowers or white-variegated leaves mixed with other colors, which is how I ended up relegating most of them to one part of the side garden—not with the specific intention of designing a “monochromatic” planting but simply because I didn’t know where else to put them. 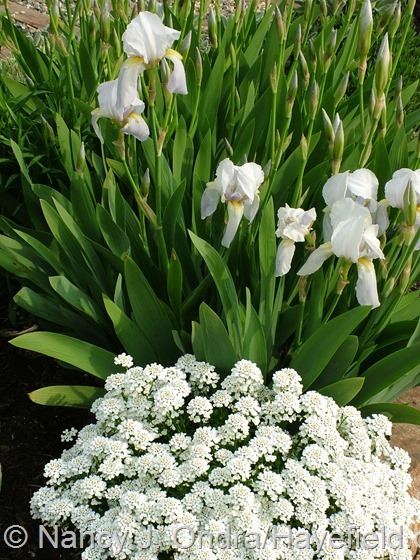 Gradually, I started to see the appeal of a white garden—or at least some white-with-white combinations. 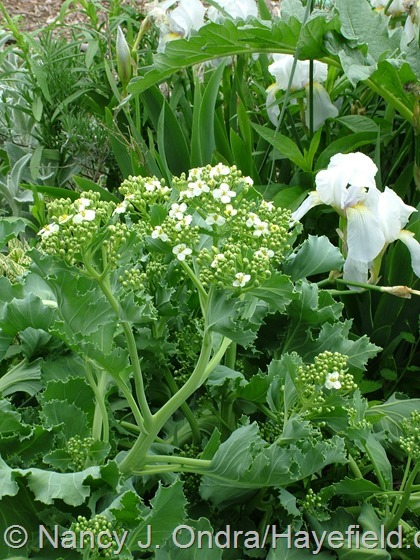 Above is orris root iris (Iris ‘Florentina’) with perennial candytuft (Iberis sempervirens); below it’s with sea kale (Crambe maritima). 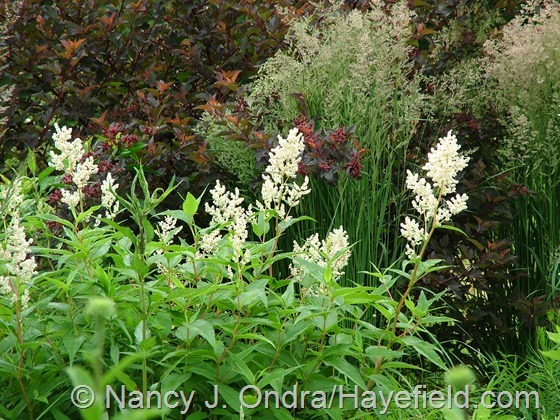 Above, American ipecac or Indian physic (Gillenia [Porteranthus] stipulatus) with variegated boxwood (Buxus sempervirens ‘Elegantissima’) and giant fleeceflower (Persicaria polymorpha). 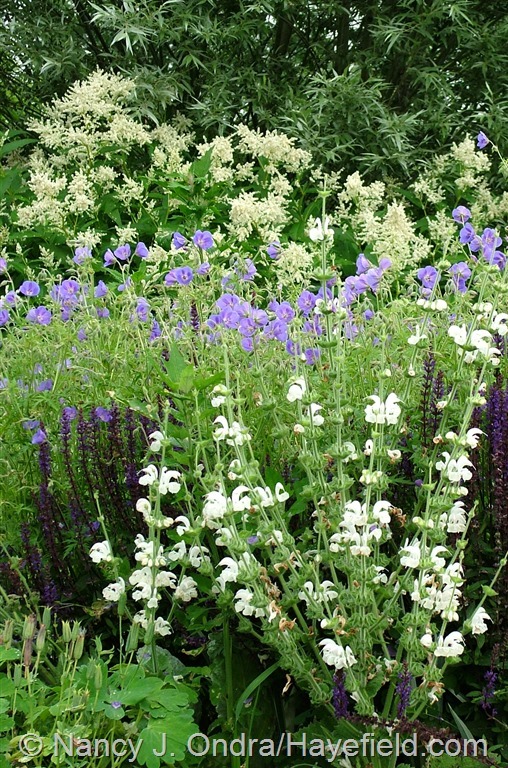 Below, white betony (Stachys officinalis ‘Alba’) with variegated ‘Prairie Frost’ purple coneflower (Echinacea purpurea), ‘Cora White’ rose periwinkle (Catharanthus roseus), and ‘Berggarten’ sage (Salvia officinalis). 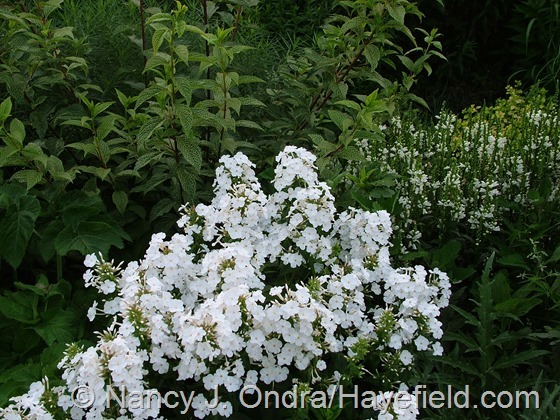 And some emphatically white phlox cultivars: above, ‘Miss Lingard’ phlox (Phlox carolina) and ‘Miss Manners’ obedient plant (Physostegia virginiana) with ‘Kumson’ forsythia (Forsythia viridissima var. koreana); below, ‘David’ phlox with ‘Silver and Gold’ yellow-twig dogwood (Cornus sericea). 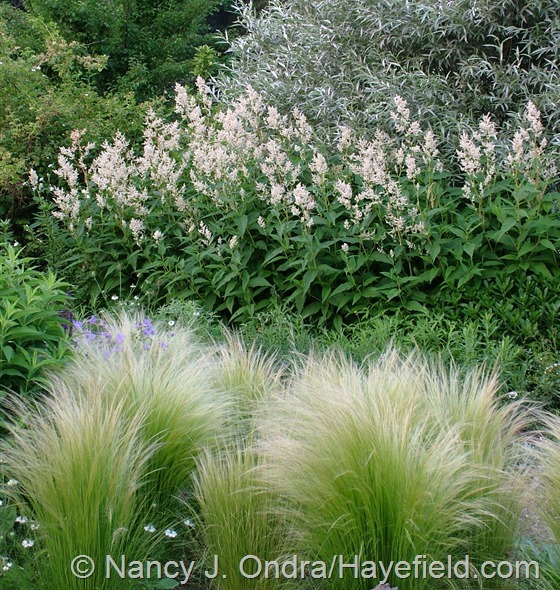 In the back above and the the foreground below is smooth hydrangea (Hydrangea arborescens), here with Mexican feather grass (Stipa tenuissima), giant fleeceflower (Persicaria polymorpha), and silver willow (Salix alba var. sericea). Over time, some of the excess blues, purple-blues, and pinks (my other unfavorite colors)have ended up in the same area, for lack of anywhere better to put them. And though the results are sometimes a bit precious, I’m getting to rather like them too. The blue-and-whites are quite nice, actually. 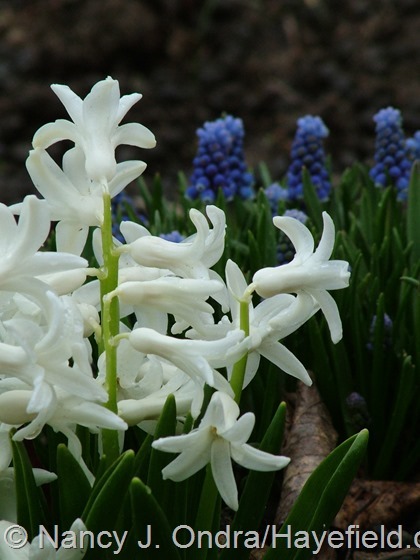 Above, a simple spring combo of ‘White Festival’ Dutch hyacinths (Hyacinthus orientalis) with grape hyacinths (Muscari). 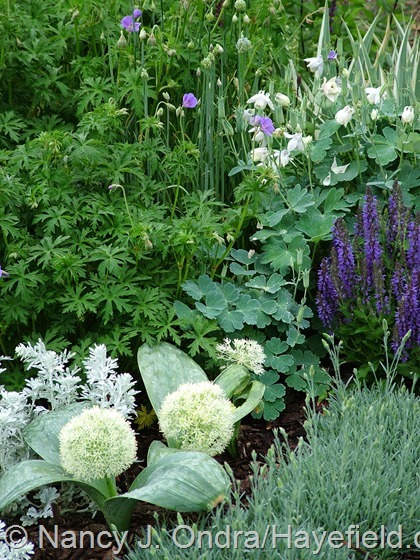 A month or so later, the quirky ‘Ivory Queen’ Turkestan onions (Allium karataviense) flower, here with ‘Silver Brocade’ wormwood (Artemisia stelleriana), ‘Brookside’ geranium, white dwarf fan columbine (Aquilegia flabellata var. pumila ‘Alba’), ‘Marcus’ salvia, and ‘Frosty Fire’ dianthus. 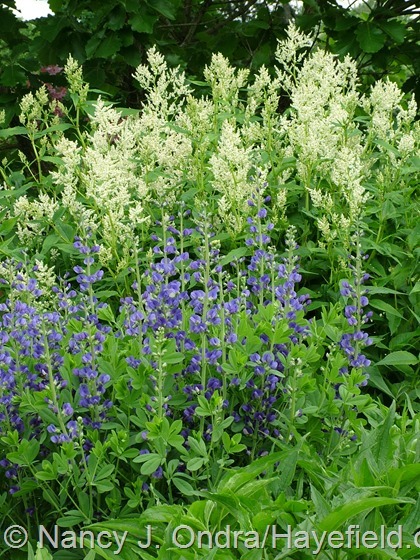 A couple of early-summer collections: above, silver sage (Salvia argentea) in bloom with ‘Caradonna’ salvia and ‘Brookside’ geranium in front of giant fleeceflower (Persicaria polymorpha); below, blue false indigo (Baptisia australis) with more of the giant fleeceflower. 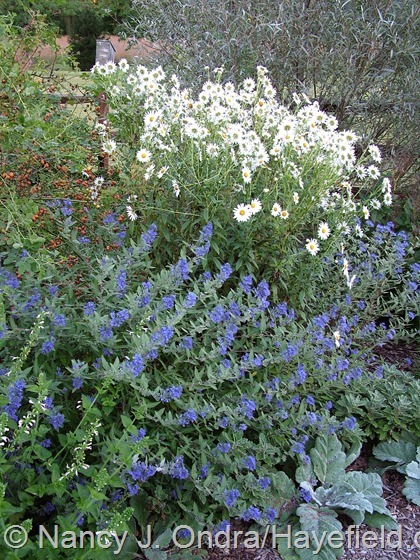 And two for fall: above, Leucanthemella serotina with bluebeard (Caryopteris x clandonensis); below, hyssop-leaved thoroughwort (Eupatorium hyssopifolium) against ‘Bluebird’ smooth aster (Symphyotrichum laeve). 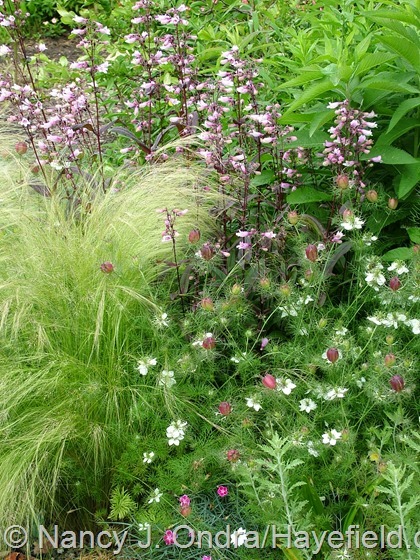 Some white-and-pink pairings in this part of the garden: above, ‘Cramers’ Plum’ love-in-a-mist (Nigella damascena) with ‘Dark Towers’ beardtongue (Penstemon) and Mexican feather grass (Stipa tenuissima). 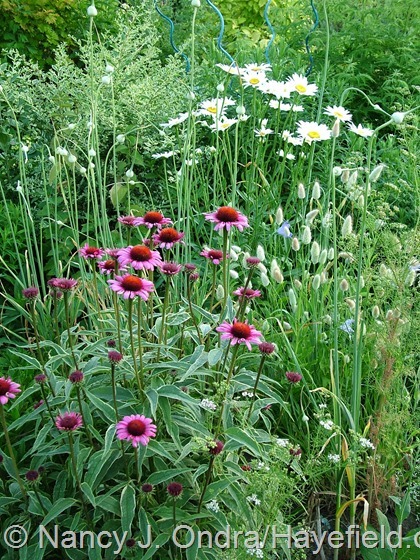 Below, ‘Prairie Frost’ purple coneflower (Echinacea purpurea) with bunny tail grass (Lagurus ovatus), ‘Becky’ Shasta daisy (Leucanthemum), and the scapes (flowering stems) of garlic. There are a fair number of whites and pinks in the outer borders and meadowy areas too. 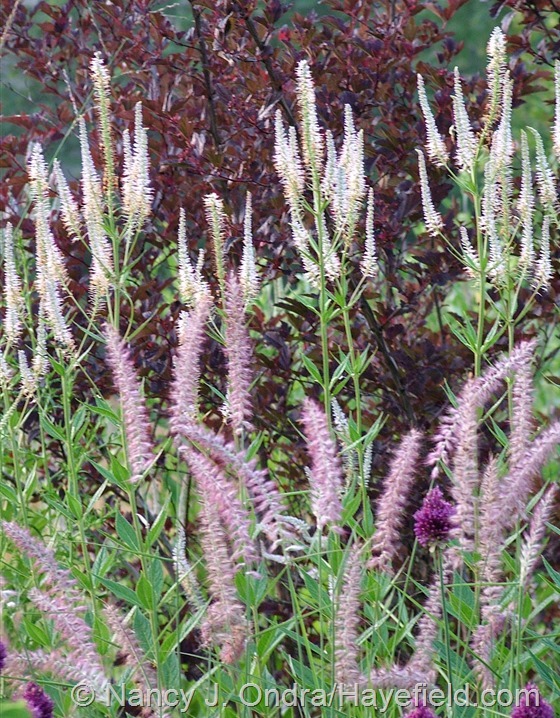 The spiky blooms of Culver’s root (Veronicastrum virginicum) are always dramatic, whether they’re with the daisy-form flowers of purple coneflower (Echinacea purpurea, above) or the fuzzy tails of ‘Karley Rose’ Oriental fountain grass (Pennisetum orientale). 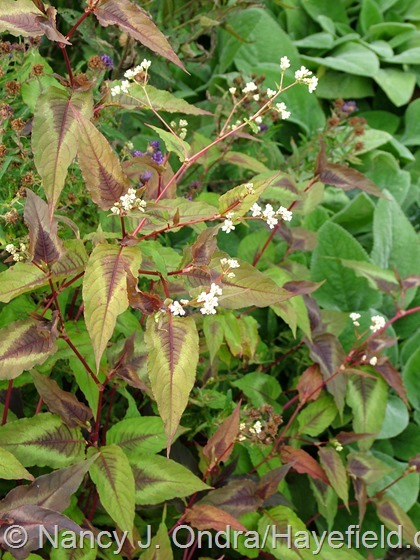 ‘Jocius’ Variegate’ white snakeroot (Ageratina aromatica, above) is a big plant that can overwhelm many companions, but ‘Crimson Beauty’ fleeceflower (Persicaria) is substantial enough to easily hold its own. 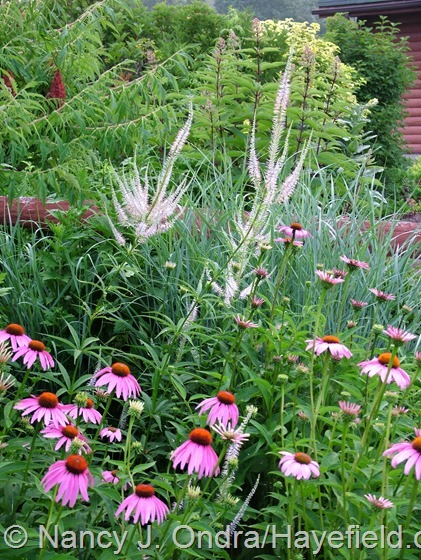 Speaking of substantial fleeceflowers, below is almost-done-flowering giant fleeceflower (P. polymorpha) with Queen Anne’s lace (Daucus carota), purple coneflower (Echinacea purpurea), little bluestem (Schizachyrium scoparium), and ‘Cloud Nine’ switch grass (Panicum virgatum). Whites are quite pretty with yellows, too. 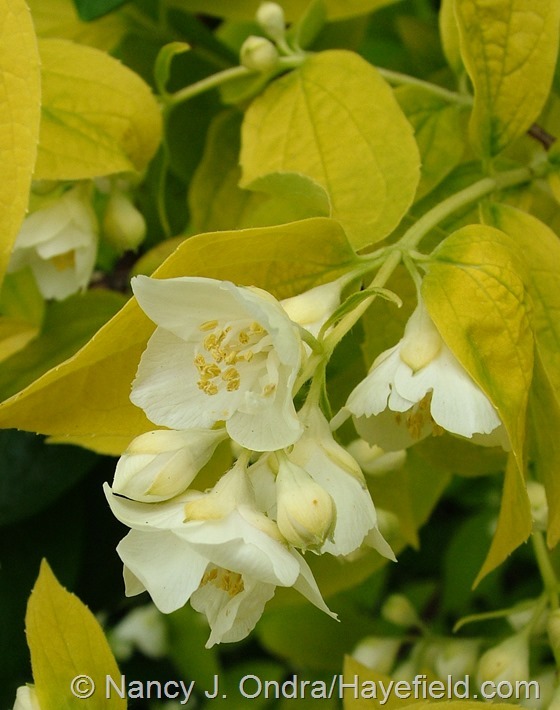 Right at the moment, I’m loving the sweet-scented white blooms of the golden mockorange (Philadelphus coronarius ‘Aureus’) that’s growing next to my side-porch steps. The flowers and foliage are a perfect combo on their own. I definitely need to start planting more white and yellow flowers together. The only image I could find in my archives is this rather messy pairing of ‘Cramers’ Plum’ love-in-a-mist (Nigella damascena) and Euphorbia palustris. 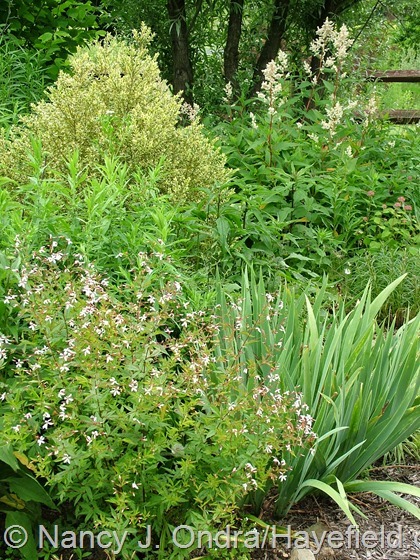 I do have some white flowers with yellow foliage, though, such as the white-variegated ‘Grace Barker’ Solomon’s seal (Polygonatum x hybridum) with ‘All Gold’ lemon balm (Melissa officinalis) above and one of the woody-stemmed white asters (Symphyotrichum) with Mellow yellow spirea (Spiraea thunbergii ‘Ogon’). Brown and white isn’t an obvious theme for a pretty combination, but sometimes it works. The late-flowering whites, especially, add a wonderful feeling of freshness when the rest of the garden is slowing down. 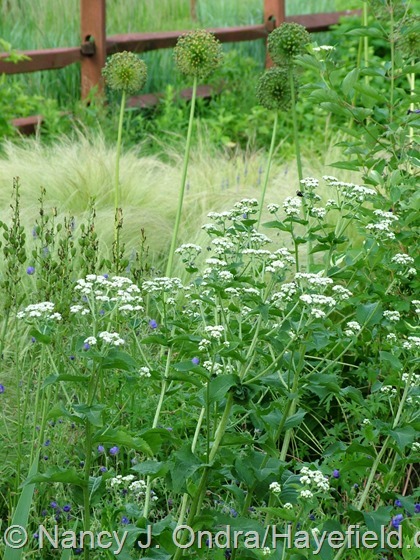 Below is hyssop-leaved thoroughwort (Eupatorium hyssopifolium) against little bluestem (Schizachyrium scoparium). 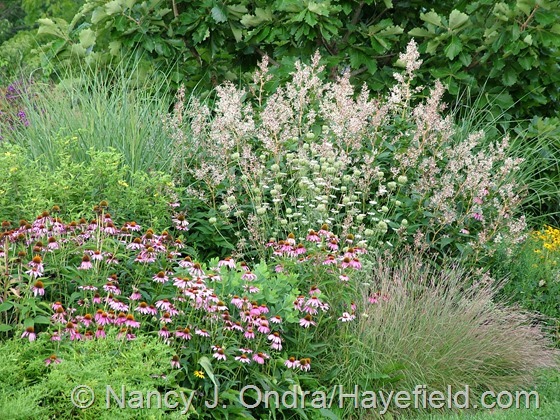 And more of the woody-stemmed white asters (Symphyotrichum), above with little bluestem and ‘Cassian’ fountain grass (Pennisetum alopecuroides) and below towering above northern sea oats (Chasmanthium latifolium), ‘Tom Thumb’ cotoneaster, and ‘Sheffield Pink’ chrysanthemum. There’s a potential for some interesting contrasts with dark foliage or flowers, as well…a sort of black-and-white thing going on. 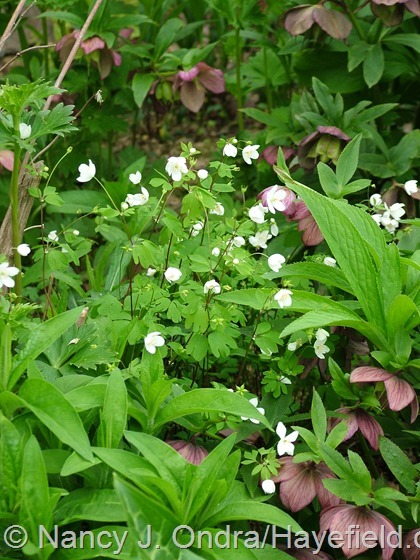 Two spring combos for shade: above, dwarf comfrey (Symphytum grandiflorum) with ‘Espresso’ wild geranium (Geranium maculatum); below, false rue anemone (Isopyrum biternatum) with a dark-flowered hybrid hellebore (Helleborus x hybridus). 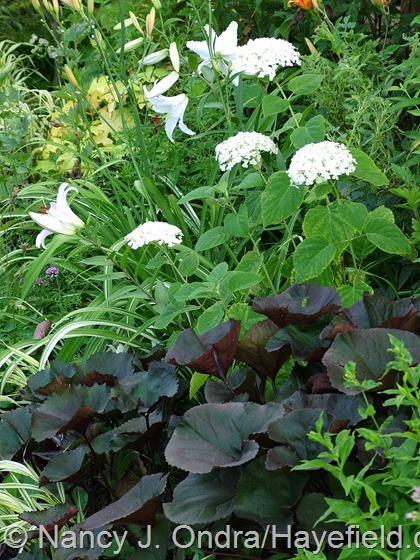 For summer shade, smooth hydrangea (Hydrangea arborescens) and ‘Casa Blanca’ lilies with ‘Britt-Marie Crawford’ ligularia (Ligularia dentata) above. 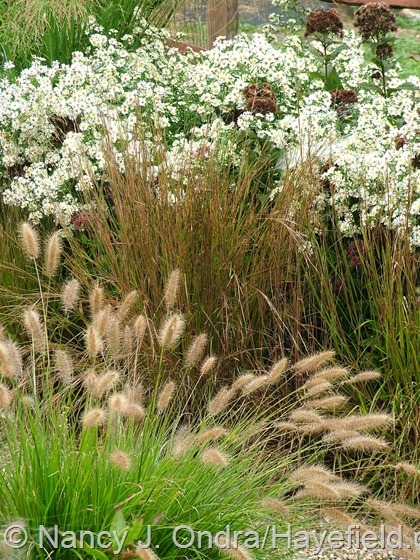 And for sun, giant fleeceflower (Persicaria polymorpha) and ‘Karl Foerster’ feather reed grass (Calamagrostis x acutiflora) against ‘Center Glow’ ninebark (Physocarpus opulifolius). The contrast effect is interesting, but I like it even better when there’s a bit of echo as well, as in the pairing below: Rosa glauca with a seedling clematis that’s very similar to the classic hybrid ‘Henryi’. 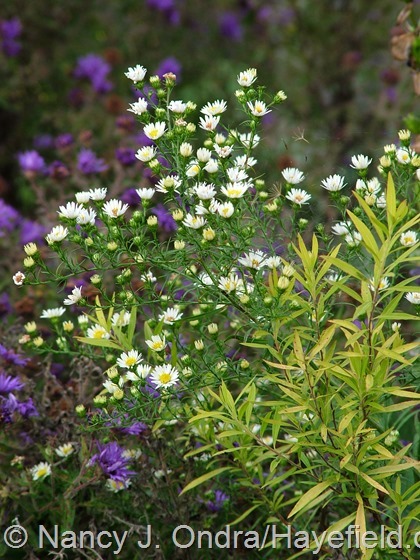 Whites have a natural affinity to partners with silver, gray, or blue leaves, as with the woody-stemmed white aster (Symphyotrichum) mingling with rue (Ruta graveolens) below. 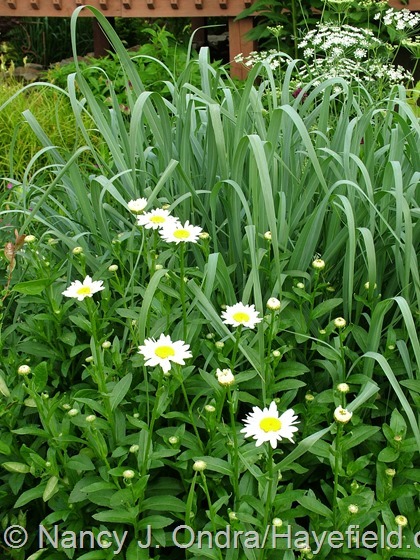 Above, bold ‘Becky’ Shasta daisy (Leucanthemum) and lacy bishop’s flower (Ammi majus) with ‘Dallas Blues’ switch grass (Panicum virgatum). And below, ground-hugging ‘Snow Flurry’ heath aster (Symphyotrichum ericoides) with woolly thyme (Thymus pseudolanuginosus). Best of all, though, is the crisp and elegant combo of white and green. 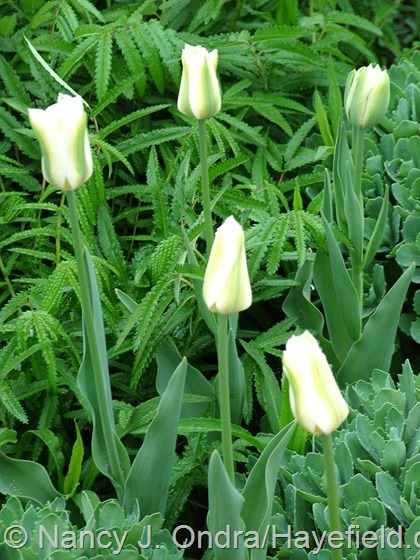 ‘Spring Green’ tulip, with a brushstroke of green on the outside of each white petal, harmonizes with all kinds of fresh green foliage. 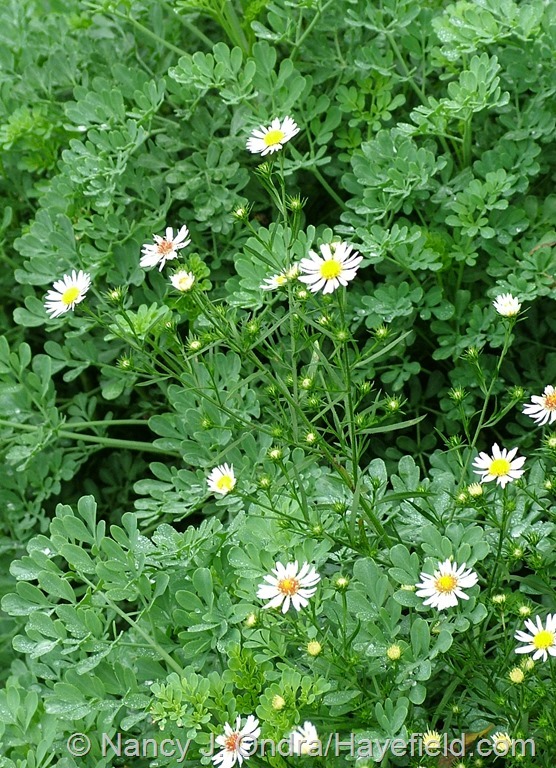 Below it’s with the leaves of white Japanese burnet (Sanguisorba tenuifolia ‘Alba’). If I ever have any more doubts about the beauty of white blooms, these last two—‘Becky’ Shasta daisy (Leucanthemum) with bells-of-Ireland (Molucella laevis) and smooth hydrangea (Hydrangea arborescens) with the emerging stems of an ironweed (Vernonia)—will always remind me that they deserve a place in the garden here…even if that place might not be the favored space out front (yet). Hi Nan, Love your clematis, tulips, the hyacinth combo and the white lilies. Great pics, and inspiration, as always. While I love hot colors, a white garden serves the purpose of a night garden. Often during the week, nighttime is the only time we get to enjoy the garden, and the white bougainvilleas, frangipanis and the white Geiger tree, all planted close to the porches, provide great pleasure. Of course most fragrant night blooming flowers are also white. So for people who mainly have the night time to enjoy their garden, a white garden is certainly the way to go. That’s a good point, Nicole. I imagine your evenings must be fantastic with all of that fragrance. I’d never heard of a Geiger tree, so I had to read up on it. It looks very interesting, though I must admit that I really like the orange version even better than the white. Hi Nan, we do have several of the orange Geiger/cordia trees but one white, which of course is the only one with blooms you can really see at night. Alas my orange is the hot orange one, I have seen but they are rare, a lighter orange shade and an almost scarlet one. Not surprisingly, I guess, the scarlet and orange ones are the most interesting to me. One of them would look really good in my hot-color area. Oh well, I can dream of them and you can wish for tulips and hyacinths – talk about zonal envy! As usual, your photos are wonderful. I shy away from using masses of white flowers myself because they seem to draw excessive attention to themselves, which can impact my ability to see the combination of plants as an integrated unit. I’ve also found that some whites don’t look at all good together. 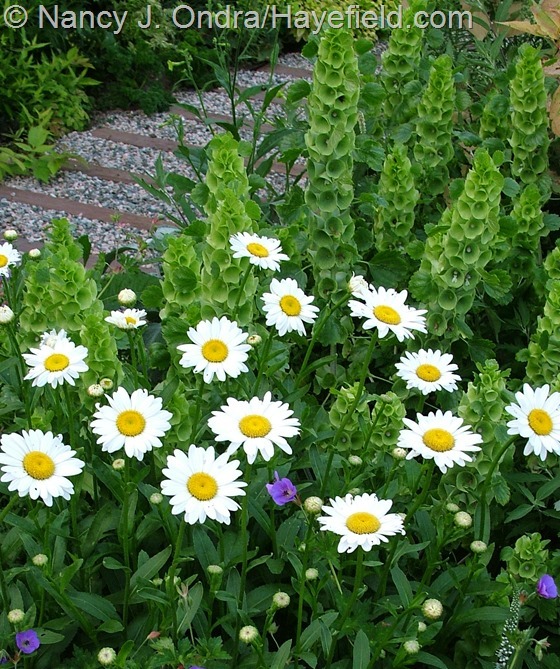 I foolishly put Nigella damascena ‘African Bride’ near a small group of Argyranthemum frutescens ‘Elsa White’ – I thought ‘African Bride’ looked awful until I saw it in one of my own photos and realized that the bright white of the daisies had made ‘African Bride’ look dingy. As you indicated, the pairings can make a major difference. That’s so true, Kris: creamy whites or grayish whites can look awful next to bright, clear white. 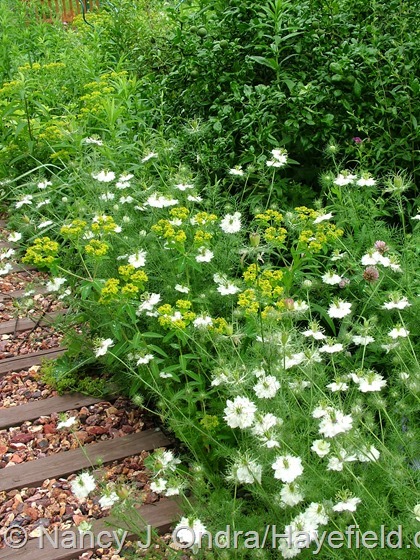 The flower size also makes a big difference: the blobby ones, like irises, Shastas, and hydrangeas, are real attention-grabbers, while the lacy ones, like Ammi majus, blend in a bit better. I really enjoyed perusing your “Just White” post — it’s a great study of relationships in the realm of white! 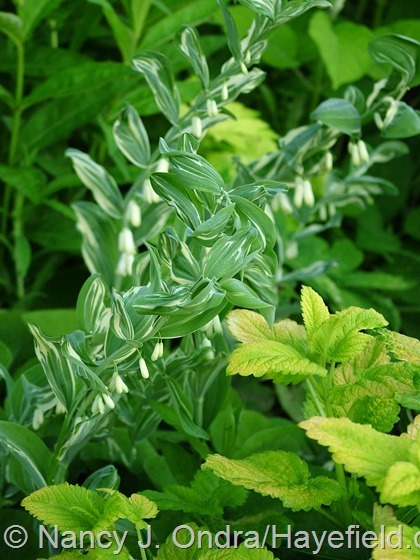 I just did a planting plan last Thursday for a micro small bedroom garden and, with trepidation, went with an all white & silver moon garden scheme… Azalea ‘Gumpo White’, Hummingbird Clethra, Astilbe ‘Snow Drift’, Clematis ‘Henrii’, Heuchera ‘Silver Scrolls’, Dianthus ‘Itsaul White’, Stachys ‘Silver Carpet’, Cerastium, and a few more smallish whites. I’m a little worried about the dingy factor but reassured that white with white is alright. Thanks for the post! Oooh – that sounds really nice, Kate, with lots of silver and green foliage and the flowers spread out through the seasons. It would be very interesting to see how it turns out. Have fun! Lovely white blooms and inspiring combinations. I’m venturing down the path of more white after growing shasta daisies and realizing how they beautifully they glow in the late evening. We love to sit on our front porch in the cottage garden and the right whites are so enjoyable. I picked the expired blooms from my ‘Mt Fuji’ Japanese iris today, so I know what you mean! 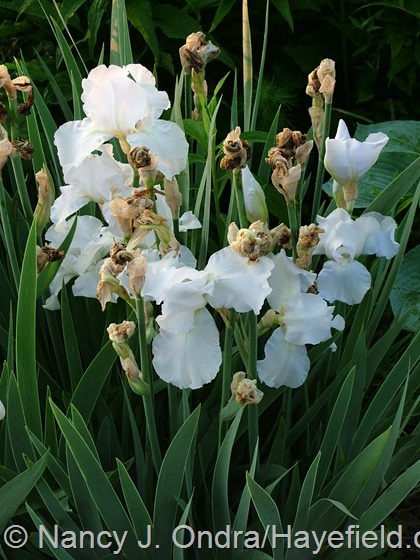 Yes, I shouldn’t single out poor ‘Immortality’: it’s one of those unfortunate traits of most of the big-flowered irises. It just seems so much more noticeable on the whites. The only thing worse would be the fading blooms of white azalea. Oh, yeah…and picking all those off is a nightmare! I am not an all white garden person either. 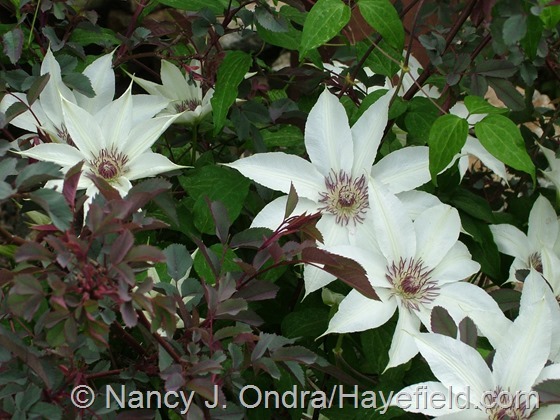 I think I have every color in the rainbow and everything in between, but as I type this I am looking at my Henryi, Miss Bateman and White Swan Clematis popping at me from near and far on my fence. In this respect white is a welcome sight. I love when white startles like Becky against the deep red roses and wine colored daylilies. Great post! That sounds like a super use of white, Eileen. And I bet as you think about it, you’ll realize that you have even more white flowers than you realized. They have a way of sneaking in where you least expect them! I already started a white garden, but it’s quite small right now, this has inspired me to make it larger! I already have a number of white plants I can split or move into there. Go for it, Jenny! Now that my white area has turned into a white-, pink-and-blue garden, I’m beginning to wonder if I need a new all-white area. Hmmm…. Oops just sent you a reply that was actually meant to be a forward! The other day I asked a garden friend for white garden ideas! So that is why it is amazing how God provides! Funny thing, Ellen…I have a number of post ideas I’ve been thinking about, but when I sat down to start the post a few days ago, the idea of a white post suddenly came to mind. I’m glad it was timely for you! I think the white/purple combinations work really well together. Also love the silver willow. I have a question about your immortality iris. This is marketed as a rebloomer correct ? Does it put on a fall show or is it more of a freak stray bloom here and there kind of thing ? Hi Jesse. Yes, ‘Immortality’ reblooms dependably for me, especially if I don’t divide it after the first flowering. (It’s a vigorous increaser, so I need to do that every three years or so.) Some years, it’s just one or two fall blooms per clump; in other years, it’s almost as good as the spring show. Oh nan your post has reminded me I have yet to send the sissinghurst white lunaria off to you. I will do that tomorrow. I have a large area dedicated to white only plants. No silver leafed things either. Just pure white flowers. I am very careful not to include dirty whites, things with pink buds, and anything creamy. The effect is stunning but to be honest I feel the challenge has gone! Perhaps time to change it up a bit? I also have a pair of reasonably new large beds near the front of the house that are yellow and white. This is a palette I should have tried long ago. It is divine. I have used bits of orange and rust to add depth. The graham Thomas roses and lemon alabaster cannas are the stars but there are also clematises, coreopsis, creamy Cali poppies, white false valerian, carnations, a standard meyer lemon tree… You get the idea. Thanks, Kerry! 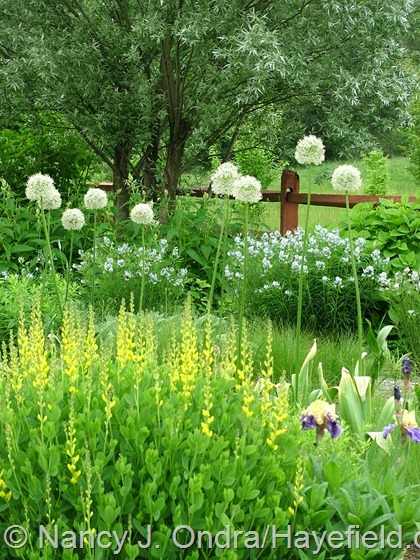 I really like the idea of the yellow-and-white garden. The ‘Alabaster’ cannas sounded intriguing, so looked them up, and they’re very pretty. I’m guessing that they stay more (and/or longer) on the yellow side when its cooler and cream when its hot. Doesn’t look like they’re available over here. Canna Alabaster is a tall (1.8m) green-leafed variety. Who would name a lemon flower alabaster? Nuts. It is a beautiful soft creamy colour with a hint of apricot in the throat, goes with everything and flowers from late spring ’til the start of winter. Mine are in full bloom still. The early season flowers are the palest, a very gentle creamy white, and get deeper as the season goes on. The later season flowers are primrose yellow. I wish I could package up a tuber for you, I have plenty! If you lived here I’d happily give you a wheelbarrow full. Oh, how interesting: the opposite of what I’d guessed. They sound lovely, anyway. I’d be thrilled to send you some of my favorites in return, if only we didn’t live thousands of miles and many import regulations apart! Hi, Nancy!! I follow you from Argentina, in South America, and i enjoy every time I get your blog! It´s amazing and inspirational. 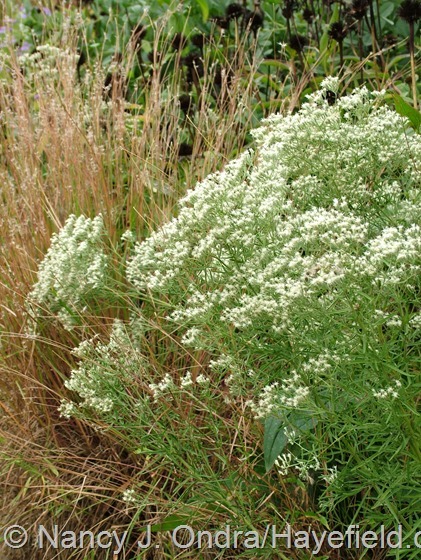 How do you manage with the weeds in your flower beds? Thank you and keep on making our lives a joyfull! Emilita. Hello, Emilita! What a pretty name you have. Thanks so much for reading. Weeds…well, mostly I try to plant so thickly that the weeds don’t have a chance. They’re mainly an issue in spring in the spaces I leave for annuals. I’m doing a thorough weeding now as I’m planting, and then it’ll just be light weeding for most of the rest of the season. I have ‘Dark Towers’ penstemon. Is ‘Tall Towers’ another cultivar? I tend to pair white with green a lot. Perhaps it’s time to branch out. Really, I think every color belongs in a garden. The challenge for the gardener is to display each color to best advantage–which seems easier for some colors than others. 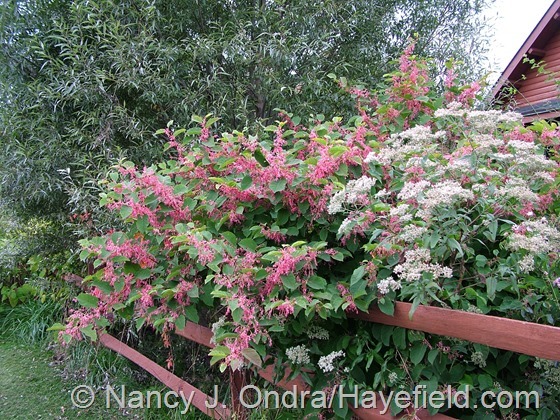 (And every gardener seems to find a different color challenging, or even offensive!) And I agree that a white flower past its prime can look pretty awful, but I never considered not growing white flowers because of that. I just vow to deadhead more consistently! Yikes! Thanks for catching that, Kathy; you’re absolutely right that it should be ‘Dark Towers’. Fixed now. You’re right about deadheading too. I’m not as good about that as I should be. I tend to take pictures first and notice the dead flowers later. Ahem. Well, you notice I said I vow to deadhead more consistently. I confess it’s a vow I consistently break. Wasn’t trying to make you feel bad, just pointing out that, in my case, it’s not the plant’s fault, it’s the gardener’s fault. I am very good at not seeing those brown blobs until I look at the photo myself. Ah yes, those good intentions. I’m actually not bad at keeping up with deadheading later in the season, but right now there’s so much planting, weeding, mulching, and cutting-back left to do that thinking about removing dead flowers is pretty low priority. Nan, loved your white theme this month. So different from all the color and very soothing. 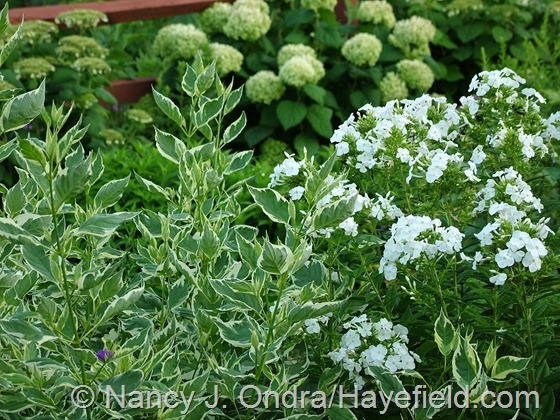 I haven’t thought much about doing an all-white bed but I certainly work a lot of green and white variegated foliage and silver foliage into my plantings. 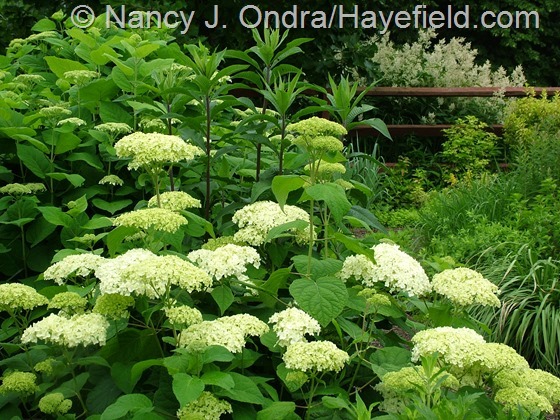 I have added hydrangea paniculata ‘Annabelle’ to a large bed to take advantage of the white blooms. I also have a prized variegated dogwood ‘Wolfeyes’ which lights up a shady spot. I feel challenged by your post to try more whites! I envy you your ‘Wolf Eyes’, Kate. I’ve admired that one for years and was looking at one in a nursery just last week, but I have a gut feeling it would be really miserable here, so I’m hesitant to try it. I do love white flowers, I try to have lots of white in my lightly shaded back garden. You have so many fabulous white flowers in these pictures, I think I love them all. 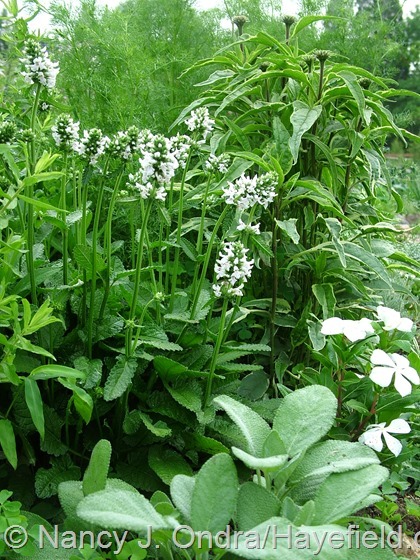 I’ve never seen white comfrey or persicaria before, and bunnytail is indeed very adorable. That’s another interesting point about white: I think it can be a lot prettier (less glaring) in a bit of shade. My garden is almost all full sun, and I find it really hard to enjoy the bright whites on sunny days. 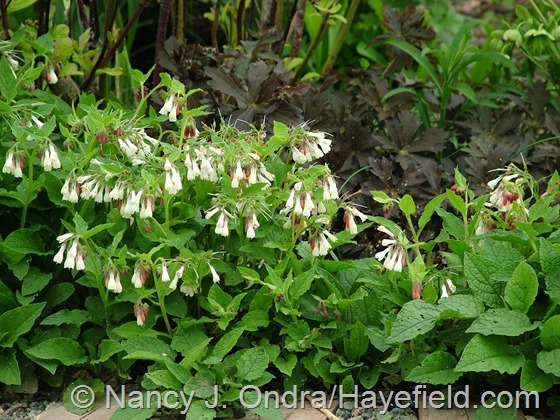 The dwarf comfrey can take a good bit of shade and dry soil (I am getting a bunch going under the silver willow); just be aware that, like most comfreys, it can be quite a spreader. Yes, I do think white flowers in shade can provide immense drama, in line with the comments about white flower at night. A chinese snowball viburnum that blooms in my deeply shaded yard draws the eye 140 feet back. 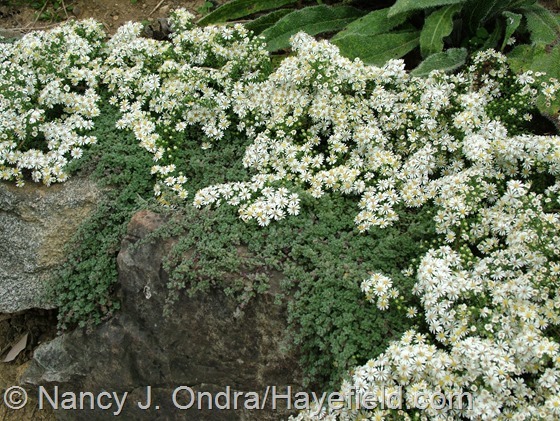 A few intriguing whites for shade: Saxifraga stolonifera, aka Strawberry Begonia, a fast spreading groundcover for me, puts up an army of scapes of airy white flowers over the silver-veined foliage. Corydalis ochroleuca is a perennial that blooms for me from April until November, surviving a few quick frosts. And regarding your yellow/white combinations, I just visited a shade garden where a large bed of yellow Corydalis lutea which is studded with white Caladium. By the end of summer, the Caladium completely cover the Corydalis. In your predominantly sunny yard, and with no innate passion for white flowers, I have to say your presentation is pretty impressively diverse, Nan! Hi there, Eric! Having seen pictures of your garden, I know you make great use of some whites to light up the shade. That Corydalis/Caladium combo sounds lovely, too! Oh, Nan, I love your whites! We tried to have an all-white shade garden but little bits of blue and purple snuck in (mostly hosta blooms, and some blue forget me nots), and our white balloon flowers reverted to blue. You reminded me of some other wonderful whites we overlooked that we could add in, now that we finally moved the tulip tree out of the “white” garden and have a big space to fill. Three tulip trees sprouted from pots of perennials we purchased at a nursery that brought them in from another state. 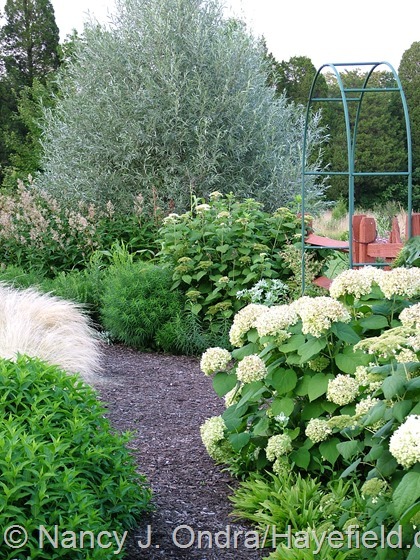 In less than 2 years, the one in the white garden was approaching 7 feet tall. We had a landscaper move them this winter while they were dormant. They are doing beautifully in their new location, but we now have a large empty spot in the white garden that needs new plants. You’ve given me some great ideas. 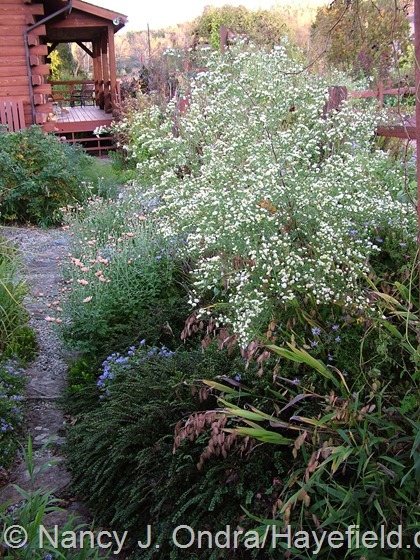 I love the woolly thyme and it would make a wonderful ground cover between the stepping stone walking path we have. We planted some white tulips last fall, but horror of horrors, they were mislabeled and bloomed red! Oh well, they are staying for now. I marked them so I could potentially dig and relocate them in the fall. BTW, the 4th picture down, the one with the cow parsley and the hint of some kind of trellis or arbor top, and the white iris is breathtaking. It would make a fabulous card. and I’m happy to see someone else besides me actually cultivating knotweed. We have it along the back fence and just outside the back gate in the side yard where we compost. The birds adore it and I have taken some of my best pix of birds while they have been feasting on the knotweed berries. I remember you telling me about your baby tulip poplars a while back, Cathy; it sounds like they are very happy to be living with you. And how wonderful to have a new space to fill in your white garden. 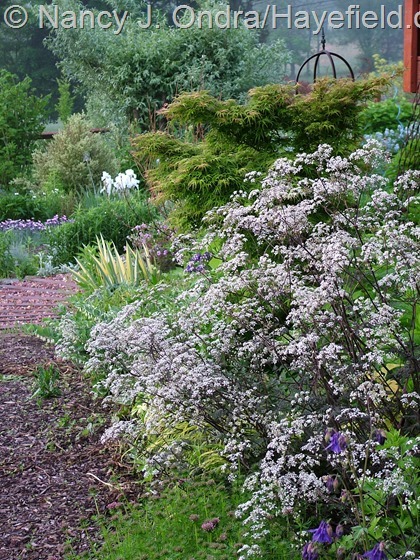 I like that shot of ‘Ravenswing’ too; that’s a tough border to photograph. Did you mean pokeweed, rather than knotweed? I do have and enjoy pokeweed as well: the variegated ‘Silberstein’ (planted) and the regular green one too (unintentional, but not necessarily unwelcome). Reblogged this on Fleeting Architecture. Hey – thanks so much, Shenandoah! Glad you liked it. And as always, some of these combinations are just glorious! I especially love the contrasting with the darker leaves… so wonderful, Nan! So good to hear from you, Donna! I hope you’re doing all right with your move. I tried to send you a cheery e-card, but it probably got stuck in your spam filter. Oh well. I wish you the best, anyway! Nan – No no no, I do have it! I just… erhm, haven’t been able to look at it… haha! Not only is there a move I’m getting ready for, but I’m also preparing for a convention I’m selling my illustrations at… so yeah, I’m under just a tiny bit of stress. Just a little bit. Well, there’s a lot to be said for being busy, right? I wish you a great tine at the convention, and good luck with the move, too. Inspired by all of your luscious combinations using Stipa, I picked up a six pack of it this spring. Lack of space and sun forced me to plant it in two groupings of three. I love the way you mass it and look forward to seeing how it performs in my garden. Beautiful combinations, as usual! You found it in a six-pack? That’s cool! Much better than just one. I hope it does well for you, Sue! Such gorgeous combinations, for not liking white you have a lot of it. I have been planting white flowers around my deck so when we eat out there at night you can see them. I do agree about the aging of white flowers. 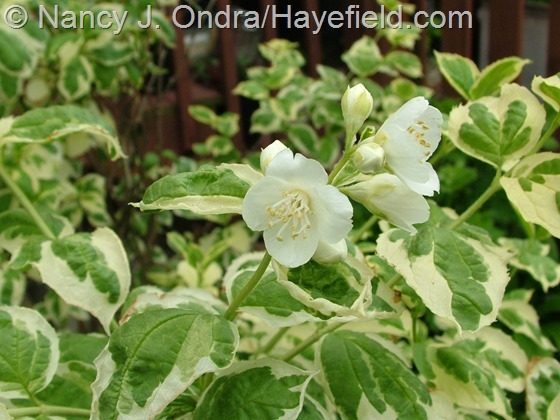 I have a gorgeous Texas Scarlet quince and decided to get the white version Jet Trail. It was beautiful in bloom but very ugly as the flowers went by. Ugh – I can imagine that the quince was about as bad as a white azalea when it was past peak. But it does sound lovely to have nice whites around a deck for evening enjoyment. Thank you for the post. The flowers on the swan plant are so delicate and beautiful–i can’t stop looking at that photo! 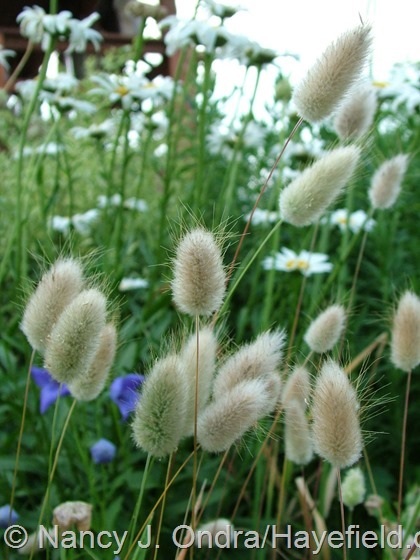 I haven’t seen the annual bunny tail grass in the nurseries hereabouts–do you grow it from seed? I agree, Kristy: the swan plant flowers are even more interesting than the seedpods, I think. I don’t recall ever seeing bunny tail grass for sale as transplants, but it’s super easy to grow from seed. Here is one source: Seed Savers Exchange. Hey, I love the little blue squiggle art in one of those photos. Looks great with those white flowers. Did you make them yourself? Your garden, as always, is inspirational. Hi David! Well, the one who does the work gets to choose, right? (Actually, I realize it doesn’t always work that way, but it should!) The squiggles are metal spirals that I bought from Gardener’s Supply Company ages ago. The original colors faded so I have repainted mine a couple of times, depending on my mood and what paint colors I have available. I’ve never found them to be useful for staking anything (their original purpose), but they’re fun and easy to move around for vertical accents. They still sell them here: Rainbow Spiral Supports. Super! I’ll look them up. I’m smiling because stakes don’t always stake, but you’ve put them to even a better use! I thought they were fancy art!!! I also have found old curtain rods can look mighty cool when painted and put in bunches. Our dragonflies love them as landing posts when placed next to a pond. Just a thought to try out when you’re making art. Thanks for the idea, David. Have fun with the spirals! They’re pretty inexpensive as garden art goes. Oh my goodness, your garden is an inspiration to all gardeners! I just love that flowering rhubarb. 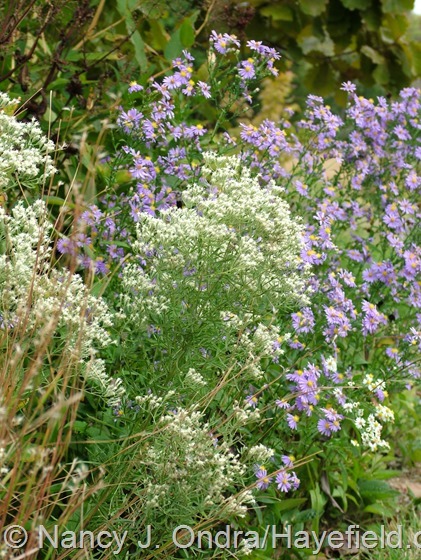 Also the rue with the white aster… too many fabulous combinations to list them all. Isn’t the rhubarb great? I don’t actually harvest the stalks, so I just enjoy it as an ornamental. Thanks so much for visiting, spurge! 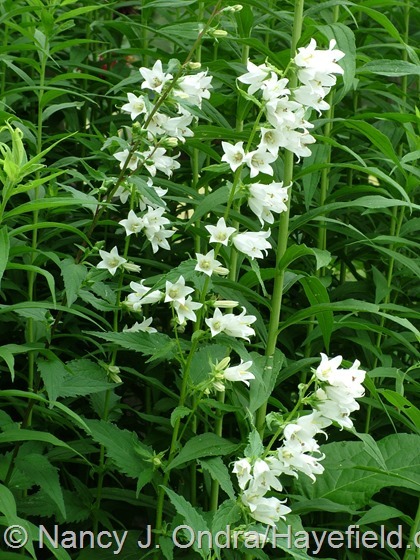 Do you have a source for the wood betony ‘alba’? I can’t find seed or plants anywhere. Thanks! Hi there, Krystol. I’m not sure where you’re writing from, but if you’re in the U.S., I may be able to send you some seeds. The plant’s just staring to flower, so they probably won’t be ready until early fall. Please email me or leave a comment on a post here in September to remind me, ok?